Peel the potatoes and place them in a medium-sized pot. Add enough water to cover the potatoes by 2 inches and add ¾ teaspoon salt. Cover the pot and bring to a boil over medium-high heat. Boil for 30 minutes or until the potatoes are tender when pierced with a fork. Remove the potatoes from the water and set aside to cool slightly. While the potatoes are cooking, in a medium bowl, mix the ground turkey with the remaining salt, pepper, paprika, garlic, adobo sauce, coriander, oregano, and cider vinegar. Coarsely mash the potatoes with a fork. Add to the turkey mixture and stir to combine. Heat a 12-inch cast-iron or nonstick pan over medium heat. Add the oil and tilt the pan gently to coat it. Add the turkey-potato mixture, spreading it in a thin layer so that it covers the bottom of the pan. Cook the mixture without stirring for 5 to 6 minutes, or until a crust develops on the bottom and the mixture turns golden brown. Flip the mixture in sections and cook on the other side for another 5 minutes, until golden brown and crispy. Be sure the turkey is cooked through and no longer pink. 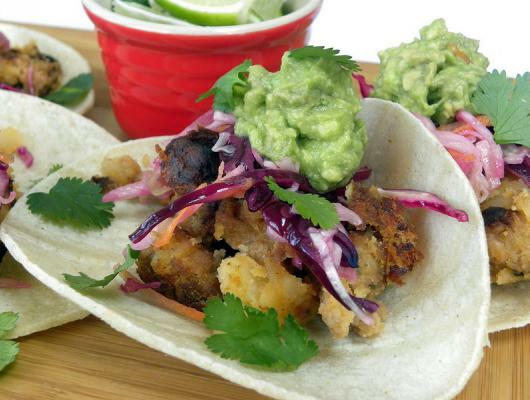 Divide the mixture among the corn tortillas and top with Cabbage Slaw and Guacamole. Serve with cilantro leaves, lime wedges and hot sauce. The turkey can be mixed (and refrigerated) a day or two in advance—for stronger and spicier flavor—but the mixture tastes best when served immediately after cooking. I have adapted a recipe from Food & Wine that combines classic spices with ground turkey & fluffy potatoes. The mixture is then cooked in oil until it turns golden brown and crispy—no need to stuff it into a casing when you have tortillas!